The leafy green originated in the Himalayas and has been consumed for 5,000 years, just not much in the U.S. until recently. Part of the recent interest in mustard greens is the cholesterol lowering ability and cardiovascular support of the raw or cooked leafy green. The link above goes into a great deal more detail of how that works for those that are interested. Rinse leaves under cold running water and cut into chunks for quick and even cooking. Let them sit out of your refrigerator for 5 minutes before cooking, which helps activate healthy enzymes. Slice celery on the diagonal, and toss in the pan along with your greens. 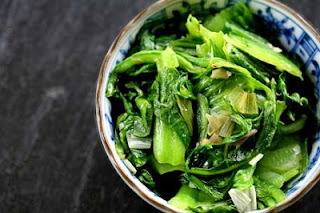 In a medium saucepan, boil a quarter cup of water or broth and add mustard greens and sliced celery. Cover for 5 minutes or until tender. Toss with a tablespoon of olive oil or coconut oil, a crushed garlic clove, a splash of lime juice, sea salt, pepper and serve at once.